Just because it’s winter time doesn’t mean you can’t enjoy the beach! The winter months are some of the best times to go shell collecting. Come take a guided walk with a Park System Naturalist along the beach, collecting and identifying some of the ocean’s natural treasures. Make sure you dress in warm clothing and bring along something to carry shells in. FREE! The Board of Recreation Commissioners is continuing to implement a plan to provide greater opportunities for visitors at Fisherman’s Cove Conservation Area. As the site's beach grew in popularity with dog owners, as well as other users including kayakers, fishermen, and wildlife enthusiasts, the Board approved a plan in 2015 to accommodate all visitor interests. A portion of the beach is designated as dog free. Dog owners can enjoy the front (east) portion of the beach while the back (west) portion of the beach is preserved for other beach activities. Please see map. This delineation of beach activities is in effect year round, all daylight hours. Signs are posted so that visitors will know which portion of the beach is designated for dog access. The leash rule remains in effect and will be enforced by the Park Rangers to ensure the safety and well being of all visitors. 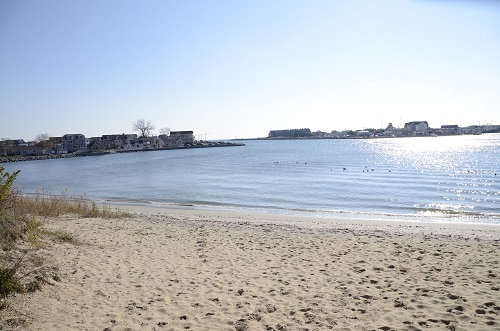 This 55-acre site, the last undeveloped tract on the Manasquan Inlet, is a great place to fish, walk on the beach, or go sunbathing. Dogs must be on leash at all times while at this park. The Park System provides an off-leash dog area at Thompson Park in Lincroft and at the Wolf Hill Recreation Area in Oceanport. The Activity Center hosts a variety of nature programs with limited street parking. Garden State Parkway to Exit 98 to State Hwy 34 south to State Hwy 35 south. Before bridge, right onto Higgins Ave, Brielle then left onto Hwy 71 (Union Ave). Right onto Fisk Ave/Brielle Road, right onto 3rd Ave., conservation area on right.